2 months ago it was announced that a few evictees from Gush Katif, from the Disengagement, had filed suit in beis din against MK Moshe Gafni (UTJ) for his having accepted the bribe of 290 million NIS for his political party in exchange for their vote and support of the Disengagement. At the time I thought it was strange, no matter how wrong Gafni was for his role in the matter, that any one person, besides for the prime minister, should be held responsible for a decision made by the entire government. As well, it also did not sound like much of a case because Gafni could easily show that other parties paid off for their support were far more crucial to the vote than UTJ was. Gafni as well thought the case had no merit and tried to have it dismissed by claiming he only follows the orders of the gedolim, so any case should be brought against Rav Elyashiv and others. 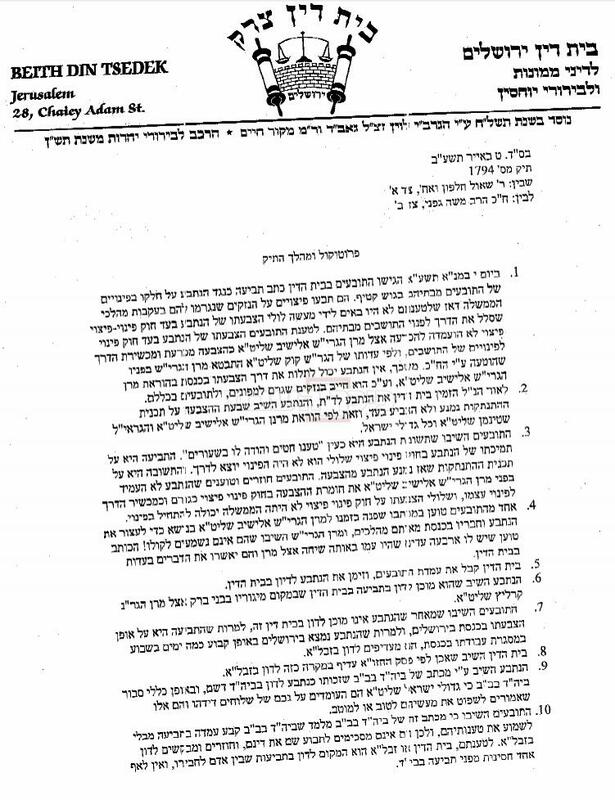 According to this report on Kikar, the case has been heard in the beis din of Rav Levin and this week they have reached the stage of summarizing the claims. One of the claims, the one the case seems to be based on, is that Gafni lied and deceived Rav Elyashiv by presenting to him inaccurate information. This information was attested to by Rav Simcha HaKohein Kook, the chief rabbi of Rehovot, who testified that Rav Elyashiv himself had said he had been led astray by Gafni on the issue. Therefore, they claim, because we have testimony that Gafni lied to rav Elyashiv to get him to order them to vote in favor, Gafni cannot rely on "listenign to the gedolim" to protect him. The beis din decided that there is enough basis to allow them to sue MK Gafni, and that Gafni cannot hide behind the claim of the gedolim told him what to do. 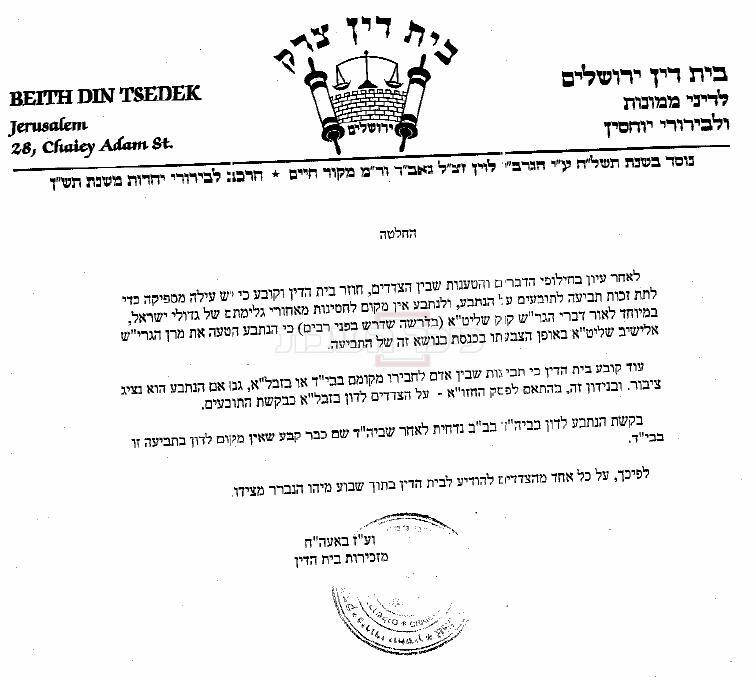 Gafni's demand to go to beis din in Bnei Braq was rejected, and they must use a "zabla" beis din (ad hoc group of arbitrators chosen in agreement by both parties). This case has turned into a bombshell. There is no way to get around the fact that the askanim are lying to the gedolim to influence how the gedolim give their instructions. 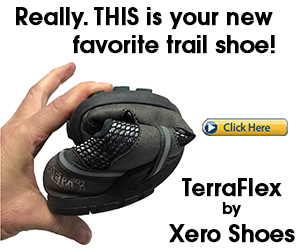 Very interesting, thanks for posting Rafi! I still think it's a crazy idea, and a terrible idea, to sue MKs for their vote, now matter how and why they voted, but on the other hand, it would be very good thing to expose and demolish this whole "the gedolim told us..." dodge. If these "gedolim" really want to make decisions, they should run for the Knesset. If they don't, they should let the elected representatives do their job, and the elected representatives should take a little responsibility themselves and stop blaming the rabbis when people don't like a decision. Power and responsibility should go together. Baruch - if MKs are elected by a public that wants them to consult with Gedolim before making decisions, then they have a responsibility to do so. The point here is that Gafni may be personally liable for damages, because he allegedly betrayed his mandate, by deliberately misleading Rav Elyashiv instead of presenting the facts honestly. I'm no dayan and I can't judge on the technical details of grama, garmi, nezek, or anything else - I'll leave that to the Beis Din. But IMO the most important principle demonstrated by this case is that you do not escape moral responsibility for causing damages just because you did it by manipulating the law. I agree that people are perfectly entitled to vote for a party to claims that it will run decisions by rabbis, if they want. But I think it's a bad idea, because if you divorce the power (in the hands of the Knesset members) from the responsibility (which these Knesset members insist on handing off to the rabbis), I think it is almost inevitable that it will lead to the kind of manipulation that takes place between the haredi parties and their rabbis. This leads to bad government, and tends to cheapen the reputation of the rabbis, in my opinion. Moreover, if legislators are subject to liability for their votes on any grounds, it will in effect subject the entire legislative process to court supervision - the problems of which I think should be fairly obvious. In the end, I agree with Arie E-B below - the solution for this is in the voting booth. If UTJ's voters are upset at how their MKs voted, or if they feel they are manipulating the rabbis, they can vote for somebody else. Agreed totally about it being a bad idea to abdicate responsibility like that, which is one of the (many) reasons why I will never vote Gimmel. But I guess at least 80% of Gimmel voters will never vote for anyone other than Gimmel, because the Gedolim are infallible and [the Askanim say that] the Gedolim say that everyone must vote Gimmel or burn in Hell, and by association the Gimmel representatives must be infallible, since an infallible Godol could not have chosen a fallible representative, so any suggestion that any Gimmel representative did anything wrong is practically apikorsus. As to legal liability for gov't decisions: l'havdil elef havdolos, the Nuremberg Laws were passed by a parliamentary majority. Was the dispossession of Jews' property and rights therefore legal? If a Jew thus dispossessed hypothetically brought a claim against the German legislators who passed those laws, should Beis Din throw out the case, because it was passed by an elected government? I do not mean at all to compare the cases in severity, ח"ו. But in terms of morality, the Disengagement Law was a shameful and totally immoral act, and the fact that it was passed by a parliamentary majority does not make it any better. Even if Beis Din acquites, the people who aided, abetted and even failed to stop it (by voting for the budget) have a huge moral stain on their account. Well, if so - and I don't necessarily agree with your analysis - I think the "stain" is shared by the people that continue to vote for Gimmel, just as the stain of the Nurenberg laws is shared by the Germans that voted for Hitler. I don't think the public can hide behind the shield of the rabbis, any more than the politicians. But I don't see the logic of asking a beit din to hold the Gimmel MKs liable, when the rabbis they invoke for their votes could easily come out publicly and say "we were misled, these people can't be trusted, don't vote for Gimmel because they don't really represent our daas torah." These rabbis have not done that, but rather, they continue to allow their names to be used in support of Gimmel. Under these circumstances, where the voters continue to vote for Gimmel, and the rabbis continue to endorse Gimmel, I simply don't see what role there is for a Beit Din. Shaul, I completely agree. That's why, like you, I would not vote for Gimmel, even if I otherwise agreed with their general hashkafa. But I think it's up to the Gimmel voters to evaluate this situation for themselves and vote accordingly. Certainly, this situation, including the Gush Katif vote, should not come as any surprise to anyone that follows Israeli politics. The immediate need is for Gafni's party, founded to revere and obey the Gedolim, to permanently eliminate such manipulative exercises by any of its MKs or other leaders. OOOOPS !!! you mean the gedolim did not truly endorse this ???? ooopsie. OOPSIE - the shrimp had the BEST heksher (not one of the Zionist ones) -- how was I supposed to know it was trief ?? iii. grave desecration - almanot of terror victims had to sit shiva AGAIN (once again, not haredim so WHO cares about them). The haredi voters who supported United "Tora" Judiasm were MORE than willing to disconnect their brain, not think for themselves because 'if its what the gedolim say, there is not personal responsibility for my action"
I can dip the old shrimp into 6 kids of sauces, if there is a badatz on the packaging, I'm covered. WELL WELL WELL !!!! -- 7 years later, it comes out that you didn't even get what the gedolim wanted. Hmmmm - maybe you ought to THINK FOR YOURSELVES once in a while. I mean, even if there is this supposed-statement from gedolim, you MIGHT wanna think twice before you stab other Jews in the back. If the 'gedolim' told you to jump off the Brooklyn bridge, would you ????? PS I wonder if there is a similar story behind Sha$-lo/OSLO - askanim misleading Rav Ovadia. I remember in September of 1993 as a young yeshiva student running around between Rabbis trying to get a petition from rabanim sent to Rav Ovadia to order Shas to pull out before the Oslo disaster was passed. One of the rabbanim said, "are you kidding? Do you know how much money they are about to get from this thing"
This is not a bribe as being reported - it's called a political compromise. Extremists of all sorts (left and right), usually don't believe in compromise with the "other", it's why they make such awful politicians. Thankfully most people who live in the real world understand the need to work with other people to accomplish things. You cannot sue a member of the parliament because you don't like the compromise they made. Just vote them out of office if want. I am just curious to know whether these people who are suing Gafni have made any attempt to sue anyone else other than him. Even if all of the allegations are true, how does one assess or even alledge the damages of one persons vote when the disengagement was clearly the work of a very large body of politicians. I know the only issue people want to bash here is the "listen to gedolim thing". Have it your way but it seems to me that the smelliest thing here is the fact that Gafni has been disproportionatly singled out to face some unique form of punishment for the disengagement when others who were clearly much MORE responsible remain free to live out their personal and political lives quietly and calmly above the hand of justice. If Gafni as the head of the UTJ Party misinformed R. Eliyashiv of the dangers of the unilateral Disengagement in order to procure the IS 290 million from Sharon, he should be prosecuted to the hilt. After Tommy Lapid took his 15 seats out of the coalition in December of 2004, Sharon made it pretty clear that without either Shas or UTJ, the country was going to new elections within three months. Three months would have cleared the air and allowed for a more at least democratic decision to go ahead with the idiocy or not. Yet, Gafni had no intention of waiting and perpetuated a vicious lie for which Jews in Ashdod, Ashkelon, and BeerSheva are paying for 7 years later. and of course Jews with homes in Newe Dekalim have been reduced to trailer park trash. He probably figured that those missiles would never reach Bnai Brak. Of course, he did not figure on the Muslim Brotherhood taking over Egypt. Of course the Lubavitcher Rebbe figured that out over 30 years ago when he alone was against the Egyptian Peace Treaty. The man is a traitor to his people of the highest order. Sue him if you have a case. Rav Eliyashiv at the time had the option to learn of his options first hand by consulting with Rav Avraham Shapira or Rav Mordechai Eliyahu zt"l. He chose not to consult with either of these gedolim of the National Religious in order to get a more rounded perspective. There would have been an offer of the table to support the various avreichim and melamdim of Rav Eliyashiv for three or four months before new elections. Yet, this offer was never even considered since no one met with anyone else's gedolim. He chose to get all the info on Gush Katif and prospective missile bombardment from his askanim. "one leader to a generation and not two leaders to a generation." Agudah asserts that gedolim, the ones on their moatzeh, make major decisions for world Jewry. The Seredie Aish remarked that if one wishes to be a gadol he should join Agudah (since Agudah, in exchange for a given community's support often adds its leader to its moatzeh - he becomes a gadol). Even if the members were all truly great torah leaders our sages state clearly that there is only one leader to a generation. We see the truth of this maxim if we observe Agudah's history since 1948. Time after time, its gedolim have been led astray by its politicians. Agudah has supported the expulsion of Jews from Gush, its role in not changing the definition of Jew is wellknown, etc, etc. In short, its history is one of accepting bribes in exchange for abandoning principles. It does not deserve anyone's vote and it would be a good thing for the Chareidim themselves if it simply disappeared as a political party.